What does this have to do with Project Gastronome? The future of food is sustainable food. Better get ready to eat some bugs, my friends. (Click that link and read it after you read this. It's a pretty interesting article.) Tonight, I'm going to pop open a can of ants in anticipation of having the last laugh when our world devolves into Mad Max or The Road. Of course, a guy as big as me can't just go into the backyard and capture some ants to eat. The task itself would be simple enough, but I'm a hungry guy. I need the Hungry Man dinner of the ant world. 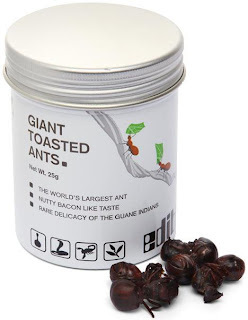 I need Atta laevigata, the largest ants int he world! 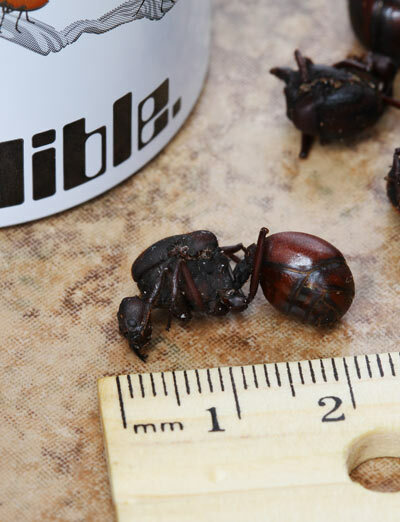 You may know them better by their Spanish name, "hormigas culonas," which translates into "ants with big asses." I am not making that up. It turns out that there are some benefits to eating the humble hormigas culonas. They are high in protein and low in fat. They are a delicacy in South America. And they are thought to be an aphrodisiac, which is why they are a common wedding gift, and which is also why I made sure to eat them on a night when Courtney wasn't scheduled to work, IFYOUKNOWWHATIMEANANDITHINKYOUDO. Gently shaking the can made a sound like a can of nuts. Not dense nuts like peanuts, but something smaller and more airy, like pine nuts or shelled sunflower seeds. Opening the can let off a smell that I can't really classify as pleasant or unpleasant, just unique. The can was so light, I thought it would have been about half full, but it's just that ants don't weigh much. That was one full can of ants. Big ants. Big, dead ants. I poured some into a soup mug, and got Blake, who's been asking me all day long what we'd be eating tonight. Just for your reference, here's one next to a ruler, so that you can get an idea of their size. The experience of eating these raised several questions. First, how could something so light and insubstantial take so long to chew up and swallow? Seriously, once it was in my mouth it felt like it was in there forever. Second, how do I describe the taste of something that tastes wholly unlike anything I have ever had before? The texture was kind of like extra crispy bacon, but not the kind that breaks down nicely in your mouth, the kind that you have to chew and chew to make it go down your throat. The taste was someplace between "nutty" and "burnt sawdust." I'll let the video tell the rest of the story. I *do* have some left, and I'll be glad to share them. Let's talk later and we can work out the details. There is no higher compliment you could pay me than to quote me to somebody else - unless you also then tell them to come read the blog. Sorry for the vomitousness. I'll make my next series Project Sparkly Cupcakes to make up for it! He gets even better as the month progresses, taking over some of the introductions and everything. That's my boy. I think he'll probably have his own blog soon, now that he's got the fire. i await Project Sparkly Cupcakes with bated breath. thanks.